We ate at True Burger, in Oakland, last weekend and have to say that True Burger is now my new burger place — post workout reward, post Tahoe/road trip meal. It's a small restaurant and they do burgers, fries, milkshakes, and that's about it and they do it really well. In comparison to In N' Out, True Burger's burgers have much better flavor, better bun, slightly larger, and less greasy. In N' Out's fries aren't very good, True Burger fries are crispy and tasty. The milk shakes are tastier too, it's vanilla or chocolate or with fill-ins like vanilla with strawberry, peanut butter, coffee, etc. You could say that True Burger is looking to create reference, by the book best versions of the American burger, fries, and milk shake and they do a ridiculously great job. Here's a much better review but essentially, no more trips to In N' Out. The other "best thing I've eaten" moment was a week or so ago when I was gifted with a Key Lime pie cupcake from Cupkates Bakery. 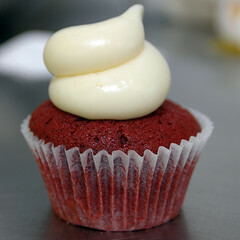 If you see the Cupkates cupcake truck, wave them down and buy the $3 Key Lime pie cupcake. It's just crazy good. I guess they drive around Oakland and San Francisco. A graham cracker crust, key lime cake, curd filled, and topped with meringue frosting. Available with or without toasted coconut.